Small Shaped Incontinence Pads are ergonomically designed to fit closer to your body than inserts, enabling greater protection against leakage. 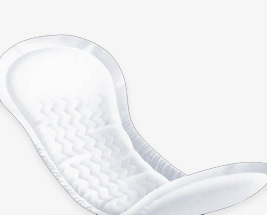 These small shaped pads range in absorbency levels and are designed to be discreet. Included in this range are pads designed to be gender specific; such as the TENA Men and the TENA Lady Pads. For more severe incontinence, our Large Shaped Pads are slightly more expensive than small shaped pads, but have faster absorbency due to the 'high loft' material.